ANZAC Day: It’s Part Of Who We Are. ANZAC Day is more than just a very special day. It’s part of who we are. Today is ANZAC Day: the day on which Australians and New Zealanders stop to commemorate and reflect on the sacrifice of all those who served our countries – very often side by side – in World War I, and ever since. 113 years after the ANZAC forces stormed the beaches and clambered up the cliffs at Gallipoli, we stand in sombre silence and remember the enormous losses of life suffered on that day, and every other day, during major conflicts like the two World Wars. Every year, attendance at dawn services, ANZAC Day marches, and commemoration ceremonies around Australia grows, even though all the soldiers who fought in World War I, and many who fought in World War II, have passed away. Peter Rock, the MC at this morning’s ceremony at the cenotaph in my local town, made a profound observation in the early moments of his opening speech: “Those who are surprised by the fact that ANZAC Day commemorations continue to draw record attendance understand very little of our national character.” He went on to speak about how and why we remember those who fought and sacrificed themselves for our freedom. Their bravery is renowned, but so is their commitment despite adversity, their mateship, and their love for their country. He’s absolutely right – those are qualities that have indeed become part of our national character. Our freedom and our mateship are the rewards of their courage and service. That’s something my town has been reminded of in recent weeks. This time, our enemy was fire, and our battle was fought with water and fire retardant foam, not with bullets and mortars. Those who faced the danger and fought to keep the rest of us safe did so knowing they were putting themselves at risk, but that didn’t stop them. Behind the fire front, they were supported by others who worked tirelessly to supply and feed them, but also to care for those who had to flee from the fires, and for all those who were traumatised by them in various ways. Of course, it’s a very different scale to what was experienced by the soldiers who went to war, but the selflessness and the determination to serve and protect is the same. Thankfully, no lives were lost in that particular war, although there were numerous casualties in terms of homes and livelihoods. It has been relentless and exhausting, yet our community has come together yet again to help, support, and defend. People may have lost their houses, but they are not homeless: we are their home, and we will make sure they have what they need to start over and keep going. In true Aussie fashion, our local community has been incredibly generous, as have many people from beyond the local area. There really is no better place to live. Today’s ceremony was, as always, very well attended. 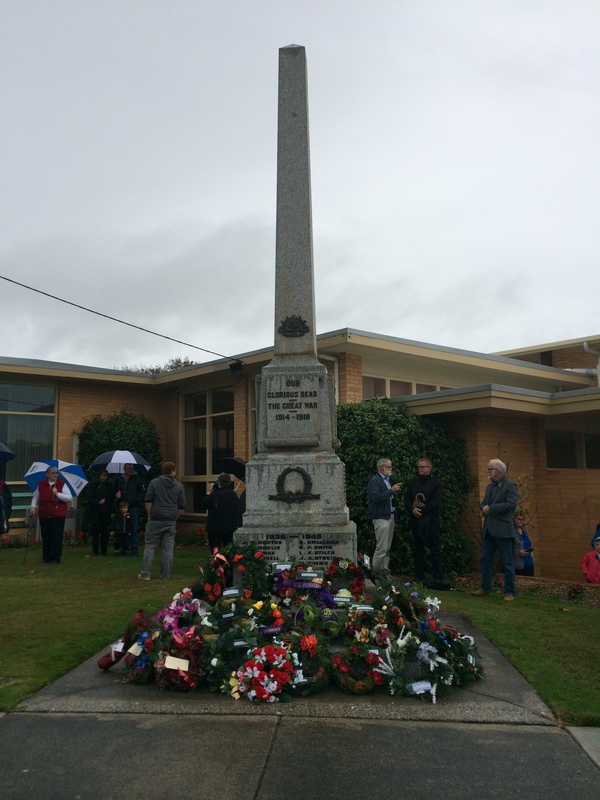 Representatives from service groups, churches, local government organisations, school students and professional organisations laid wreaths in memory of the fallen. Families stood together, some wearing medals that belonged to fathers, uncles, or grandparents who served in the military and have since passed on. The flags of both Australia and New Zealand were flown at half mast until after the minute of silent reflection, and the national anthems of both countries were sung. Tears – whether of sorrow for the fallen, of thankfulness for the freedom we enjoy, of patriotic pride, or a combination of all those factors – were shed. This afternoon, there’s a big concert being held on the local football ground, not just to raise funds for fire relief, but also to give some joy and celebration back to a community that has done some really hard yards over the past six weeks. Talents from both the local area and further afield will be performing. Local businesses are providing catering, entertainment, and every other service that’s needed. And you can bet your bottom dollar that the locals are going to turn out in force to support that concert, and each other, because that’s what we do. We stick together in times of trouble, and we cheer each other on in our victories. In doing that on ANZAC Day, we will continue to remember the lessons we learned from the ANZACS and all our other diggers. At the going down of the sun, just as we did in the morning, we WILL remember them. 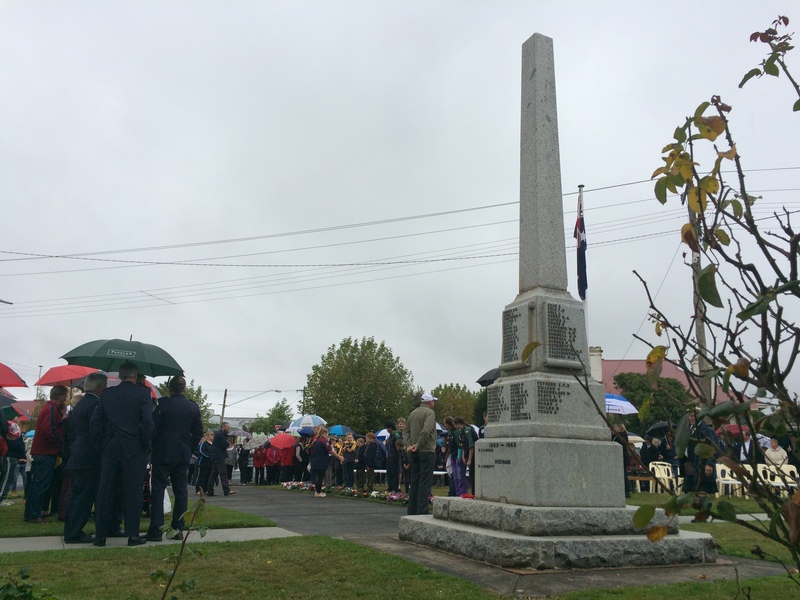 Hundreds of people attended the ANZAC Day memorial service at the cenotaph in Cobden for the 100th anniversary of the Gallipoli landing. There were thousands at the dawn service in Warrnambool and hundreds of thousands at the dawn service in Melbourne. The grey clouds and steady rain did not deter them: instead, it seemed appropriate for a time of sombre reflection. 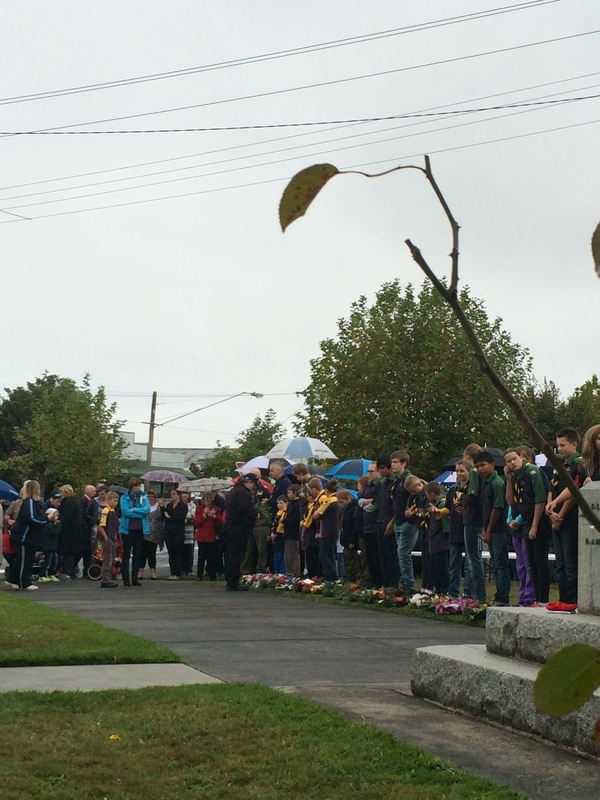 In Cobden, the path to the cenotaph was lined by a guard of honour consisting of our Scouts and Girl Guides. 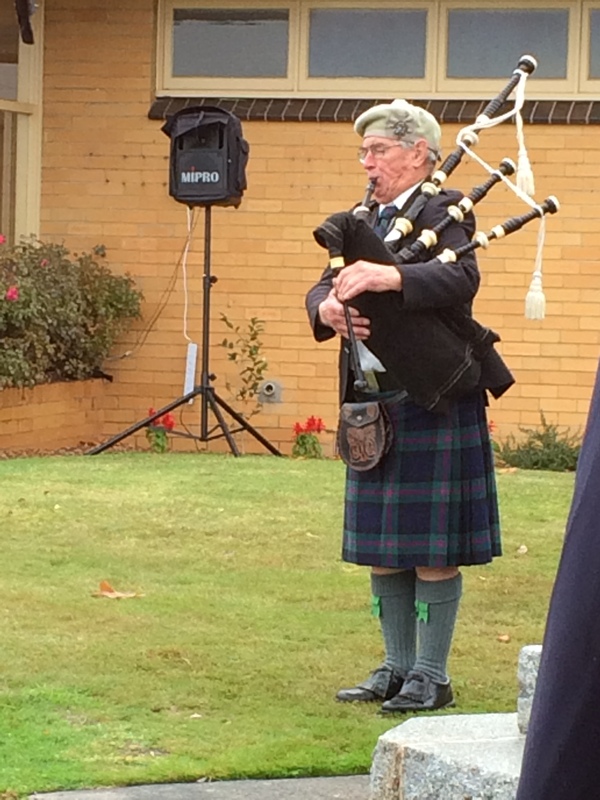 A lone piper played in tribute to the fallen and in honour of the returned servicemen who were present. Hearing the New Zealand ode spoken in Maori was very powerful, even though most people there couldn’t understand a word of it. The speaker’s love for his country and thankfulness for the ANZACs and all those who served after them was evident through the emotion in his voice. The Australian ode was spoken equally powerfully.It was impossible to remain unmoved by all the feelings of love for my country, gratitude for those who have served and the freedoms we still have because of them, and sadness for the loss of life on both sides. I made no effort to hide several tears that spilled down my cheek when they played The Last Post and during the period of silent observance before they played the Reveille. When they played the instrumental version of the Australian national anthem there was no invitation to sing, but half the crowd sang anyway. I would have loved it if everyone joined in, but I guess the “I’m not singing in public” sentiment is still strong among many people. 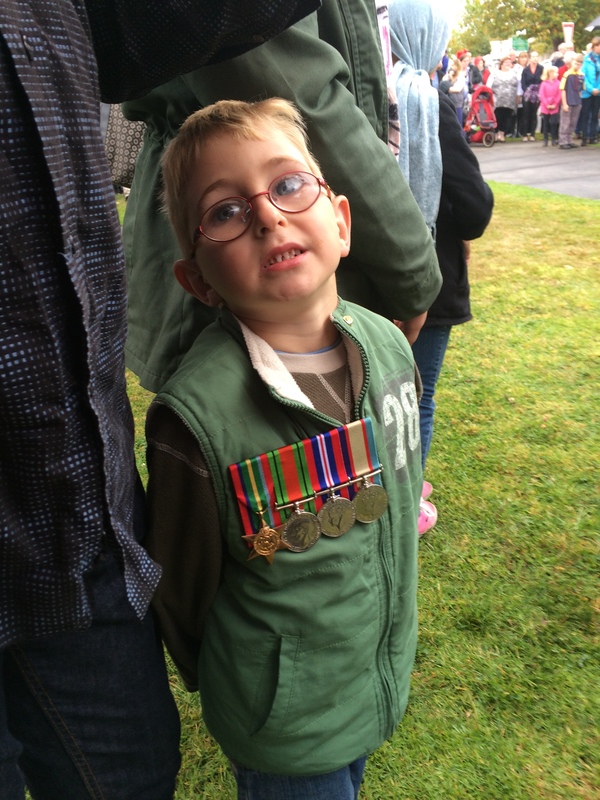 It was beautiful to meet a little boy, Euan, who was incredibly proud to be wearing his great-grandfather’s war medals. I watched him stand attentively and proudly through the whole ceremony. He had obviously been made aware by his parents of the importance of the medals and the reason for the commemoration, because he took it all very seriously. I am so thankful that remembering those who served their country and their fellow Australians, New Zealanders and allies, often at the expense of their own lives, is so important to so many.